Home /The SIOS pilots are underway! The SIOS pilots are underway! 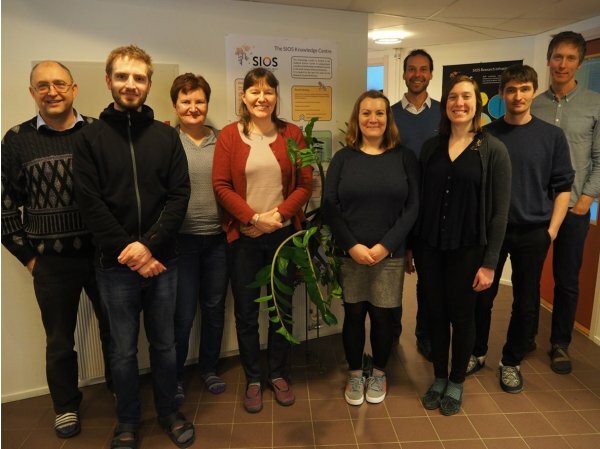 March saw the commencement of the SIOS pilot projects, with three of the funded projects meeting in Longyearbyen this month. First up was the project SuMOGPR, which consisted of fieldwork on Von Postbreen. This project was supported by the logistics department at UNIS. Next up was the PermaSval group, which held a workshop at UNIS to discuss brining together permafrost data from across Spitsbergen. The data will be presented in a chapter for the SESS report. Our Access and Logistics Officer was invited and attended the first day of the workshop (see photo below). The third group to arrive was the SOS project, who conducted a traverse from Longyearbyen to Ny Ålesund and back, collecting snow measurements along the route. They will also do similar measurements between Longyearbyen and Svea. This project was supported by the logistics department at NPI. More SESS projects are underway in other locations, and more access projects will follow during the summer. It has been exciting to see the start up of some of the projects here in Longyearbyen, and we look forward to hearing how all the groups got on. We wish everyone the best of luck with their work going forward, and thank you all for your participation in the SIOS pilots! A big thanks also to the SIOS members that have contributed to the SIOS pilots, as it would not be possible without you. Mauro Guglielmin, Insubria Uni, Italy; Graham Gilbert, UNIS, Norway; Marzena Osuch, Polish Academy of Sciences, Poland; Hanne Christiansen, UNIS , Norway; Inger Jennings (14th only), SIOS; Ullrich Neumann, UNIS/Geokolibri, Norway; Sarah Strand (14th only), UNIS, Norway; Nikita Demidov, AARI Russia; Ketil Isaksen, met. No, Norway. Not able to come Julia Boike, AWI, Germany.